Dramatic weather came down the river, raining in one spot and sunny in another. 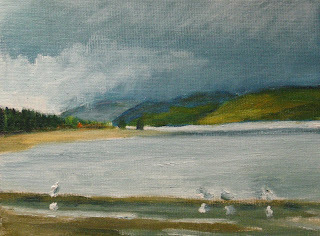 I wanted to capture the serenity of the calm water and gulls wading against the moving clouds and dark sky. It's your other son Evan, So Great to see your beautiful and inspirational work up and out in the public eye. I'm moving to TO to keep an eye on the boys and there new venture! Miss and love you and the man!